I was recently interviewed by Jack Sweeney for his podcast series called CFO Thought Leader. This was the fourth time I was interviewed by Sweeney, and I enjoyed our conversation once again. I believe you will find the conversation interesting and relevant. How involved is the Board when hiring a CFO? How can a CFO hire go wrong? How can a CFO going through a hiring process work through the CEO/Board dynamics? What advice do you offer CFO candidates before their first interview? If a CFO hire is going to happen, what is the time frame to make it happen? How do you help CFOs with executive coaching? What advice would you give a CEO trying to evaluate a CFO candidate? What part do part-time CFOs play in the market today? When is the right time for a company to hire their first real CFO? Who engages an executive search firm for a CFO hire? What advice do you have for senior finance executives that want to build relationships outside their business? Which comments resonate most with you? Let me know what you think below, or email me. 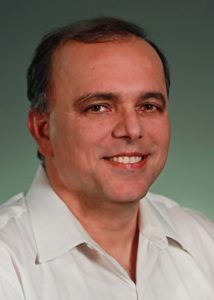 The following is a summary of our interview with Sajid Malhotra, who was appointed CFO of Limelight Networks in April 2016, as announced in CFO Moves. 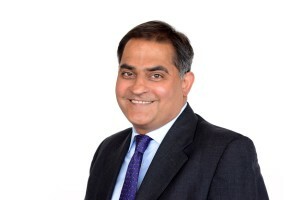 Prior to being appointed CFO, Sajid was Chief Strategy Officer at Limelight Networks, and worked in strategy roles at Convergys, NCR Corporation and AT&T. Sajid Malhotra: Professionally I recognized the higher responsibility and opportunity to assist in turning around the business. In my previous role as head of strategy, I could influence but this was clearly a lot more. The personal motivation was that I have a desire to assist other company Boards and being at a C-Level position would facilitate that goal. SD: What challenges did you face becoming CFO when you were not classically trained for the role? SM: I was at the right place at the right time. There was an abrupt departure of the CFO and I expressed interest to be the next CFO. I knew that the role would be a challenge but I felt, based on the underlying support team, there was low probability of failure and a very high probability of success. I felt I possessed the right skill set to turnaround the business for all stakeholders and wanted to take on the challenge of being a key member to turn a broken business into a successful one. Despite the position being outside of my comfort zone, I recognized, it was an opportunity I should not pass up. SD: Did you find it challenging to move into the CFO role, acquire a new team and get the results that you need (or able to get them to perform)? SM: I am a firm believer of not reducing workforces and in giving the incumbents the first chance. I believe keeping and motivating my team is the first order of business. My job is to make the team and the environment I inherit better. Over the course of my 30-year career, I have let the same principle guide me, regardless of the company, the industry or size. SD: What do you feel are the key qualities for successful leadership? SM: Leading by example, honesty and transparency, is a requirement. Leading by example and letting my team see how I interact with all around me, my sense of commitment and responsibility helps modify team behavior accordingly. People self-learn and perform. SD: How important is it to have your people believe in you? SM: Extremely important. I cannot do this alone. With my team, I can. My resume, experience and capabilities are important elements to getting a job but to be successful, it is all about the team working together towards a common goal and with a clear and unified purpose. SD: How do you deal with change? SM: I don’t think people handle change well in general. I have found that when you get the first series of changes and are successful, momentum picks up, employees attitudes change, and the trend becomes your friend. SD: How are relationships important to you? SM: Strategy and M&A are transactional roles. The CFO position requires higher engagement and entanglement, not just with the employees, but with vendors, customers, shareholders, community and competitors. I may have underestimated the amount of time investment required to be good at all this. It is a requirement for success. SD: In your experience, what has been the difference between giving advice vs. taking advice? SM: I always found it easy to give advice to CEOs, CFOs and boards but taking advice is 180 degrees different. Much, much easier to give and I have higher respect for those who constantly receive. SD: How important is time management to a CFO? SM: The CFO position requires a lot of time to do the job well and everyone is asking for your time. It is very easy to get buried in work if one does not manage time well and so, it is crucial to manage it well. We only have 24 hours in a day and time is an equalizer. Do a few things and do them well. Delegate the balance to trusted team members. Opportunities will only return what you invest in them. SD: What advice do you have for contemporaries considering taking on the CFO role? SM: Self-awareness as well as conviction are key. The CFO is the gatekeeper to the value vault. Do it well and you create value, do it poorly and you destroy value. Setting expectations and priorities before accepting the role rather than figuring them out after you have accepted the position is important. Ask for help. Take help. Leave personal biases at the door. SD: Now that you’ve been CFO for over a year, what is your impression about the Office of the CFO? SM: The CFO is most often the second most important role at any company, and for good reason. I find it an honor to be a CFO. I am temporarily occupying a position and an office. I need to make sure I don’t dilute the role for those who will follow me. A CFO Success Story is a feature of Samuel’s CFO Blog, where Samuel Dergel follows up on his book, Guide to CFO Success, speaking with CFOs featured in CFO Moves and CFO Moves Canada, Samuel’s popular and comprehensive weekly report on CFO Movement across the USA and Canada. 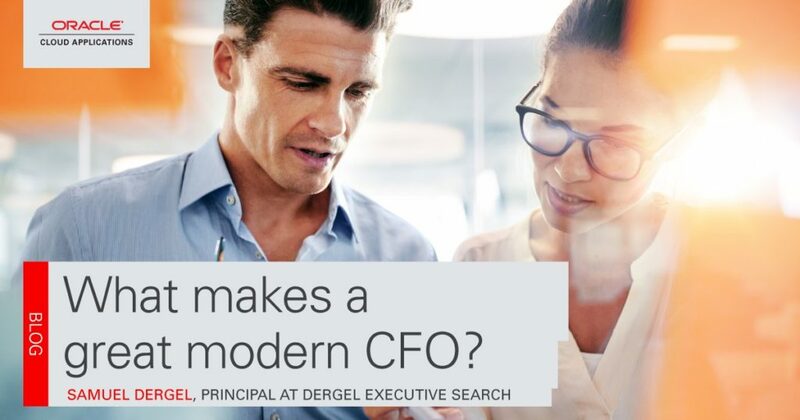 What Makes a Great Modern CFO? Being a great CFO is about much more than just looking at the numbers. Accounting may be a technical field, but the modern finance department cannot thrive on technical skills alone. Every client I speak with is adamant about this when looking to make a hire: the best CFOs don’t just “get” the numbers, they are also great leaders and strategic thinkers. I asked a number of advisors which qualities distinguish the best CFOs when writing my Guide to CFO Success, and they narrowed these down to three. TABLE 1.1 What Is and What Is Not a CFO? The finance department has been playing more of a partnership role in the organization, and CEOs are increasingly looking to their finance leaders to help drive wider business strategies. It is not enough to simply report on performance at regular intervals; CFOs need to make decisions and shape their action plans based on the company’s ambitions. What’s more, as the keeper of all the company’s data with a view of every department’s objectives and performance, CFOs must also step up and play an active role in refining and aligning business strategies. As the CFO steps out from the shadow of the finance department and sits at the right hand of the CEO, they are becoming a true business leader in addition to leading their teams. I liken the CFO’s knowledge to Solomon-like wisdom that comes from years of experience, finely-tuned business acumen and a deep understanding of the number behind sound business decisions. With the finance department as a whole shifting away from traditional accounting, CFOs also need to lead by example while broadening their team’s skillset. Versatility is the hallmark of today’s finance professional and CFOs need to find ways of attracting and hiring people that will help strengthen the finance department’s position in the business. Perhaps the biggest change in terms of the CFO’s role in business today is that their advice is not only valued—it is necessary. Businesses are currently dealing with a wave of disruptive competitors and fast-changing customer expectations, while also managing a global talent shortage and volatile financial conditions. The wisdom and experience of finance leaders makes them indispensable in the boardroom as companies look to tackle one of the most uncertain economic periods in decades. As part of this, CFOs also need to be able to sell their ideas. It is one thing to develop a robust and well thought-out plan to help the business tackle its challenges, but unless CFOs can articulate their ideas to non-finance experts these plans may never get off the ground. A strong background in finance principles is essential to any CFO. A seasoned finance professional will have developed a large bag of tricks over the years that make them ideally suited to managing complex numerical issues. However, many of these skills won’t differentiate CFOs from their colleagues with similar backgrounds. It is business consultancy skills such as strategic thinking, team management, and inter-departmental coordination that will set the best finance leaders apart and help them establish the finance department as the strategic core of the business. This blog was originally published in Oracle’s Modern Finance Blog. Are CFOs diligent enough in their due diligence prior to accepting a new CFO role? The impact of tone from the top on CFOs. The importance of CEO/CFO chemistry for a CFO job seeker. How CFOs and CEOs can work together successfully. What CFOs in the job wish they knew before they accepted the job. The challenges of building the right Finance team as a new CFO. The following is from an interview with Jim Burns. 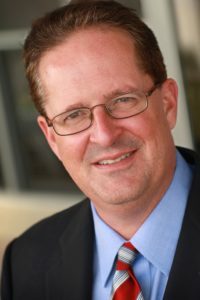 Jim became CFO of Accela in June 2016. Previously, Jim served as CFO of Silver Spring Networks, as announced in CFO Moves. This interview was edited for clarity. Some key challenges to a rapidly growing software companyReally making sure that you integrate well and deliver on your promise. Progress shifting from more license based models to cloud based and recurring SaaS based models. There’s been such a shift to cloud, and to analytics, and to SaaS. New companies, those that are starting the kind of legacy free, are the ones where all the growth is coming from. Get as broad a level of business and operational experience as you can. You get a totally different perspective looking through the lens of somebody in the business versus somebody in finance. I’m seeing more and more CFOs these days that didn’t come up through the public accounting ranks. It seems CEO increasingly wants to be able to spend their time externally making a name for the company with customers and wants a CFO that can make sure that everything, not just the numbers, come together, and that the business is operationally being optimized continuously too. Take chances to do jobs you’ve never done before. Your job isn’t just to run it, but to make it substantially better when you left the role versus when you started it. I shy away from jobs where everything is working perfectly when you go in, because there really is no other way but down. Samuel: Congratulations on your move to Accela. How do you feel? What are you excited about? Jim: Well, this is a company that I had to do a fair bit of digging into, to get familiar with it, before joining. And the more I learned about it the more excited I got. They’re really in a great place, and there’s not a lot of competitors. If you think about the enterprise software space, there are so many people trying to get in, and this company has been a market leader and it’s successful. Once you get into state/local governments business, it’s about as sticky as it gets. They just don’t churn very much. It really builds a nice client base, SaaS platform from civic engagement, they’ve been broadening their portfolios through both, organic development and quite a number of acquisitions, and I think it’s just a very exciting space to be. If you look through some of the comparatives they have in the public marketplace, they traded eight nine times sales multiples, because investors just appreciate how strong and sticky this business is. So that’s very attractive. Also the management team is great and the board is great, and everyone is very engaged and focused, and that’s a big deal for me too. Samuel: At what point in time during the interview process did you decide that this is the place for me, this is where I want to go? Jim: My initial interview with the CEO was very good and then I got even more excited talking to Mark Jung, who’s the chairman of the company. Mark has been around quite a number of opportunities and he’s been CEO of multiple places and on multiple boards. He really validated everything I hoped the opportunity would be, and then some. So it was fairly early on that I got excited that this might be a great thing. Samuel: You’re in, and you’re trying to figure your way around this new organization. What do you see are the challenges ahead of you? Jim: I think the markets are growing great, the company has been through a lot of change recently with quite a number of acquisitions. And that’s heavy lifting and the company is working through it. They made nine acquisitions over just a few years. So really making sure that we integrate that well and deliver on the promise, that we get them making great progress shifting from more license based models to cloud based and recurring SaaS based models. And that’s a wonderful thing to do when you’re private versus public. So just continuing the post that mix shift and in trying to get the EBIT margins where they can be for a company of this size. Samuel: You’ve come from HP, the technology company that it was and still is a very large and successful business. And you’ve made a transition in both your previous opportunity and this opportunity to a much more entrepreneurial, high growth situation. Tell me about that. How was the experience, what have you learned? Jim: That is a very interesting question. The HP that I left was very different than the HP that I joined back in the late 80s. Hewlett and Packard had set the company up and the very engineering culture to go after growth opportunities. They then realized that the real brilliant engineers did not want to work amongst thousands of other engineers, so they set the company up as a bunch of small to mid-size businesses that had all the resources they needed to either succeed or fail. Most businesses I worked with were anywhere between four to six hundred people-sized businesses. The HP I left had consolidated so much. The division I was in had a hundred and thirty thousand people. So when I went to Silver Spring it was kind of like going back to my original HP route. It was seven hundred people, 300 million dollars in revenue. And Accela is very much in the same boat. Honestly, I enjoyed the earlier days in HP better than the late days in HP, even though I had a much more senior level of responsibility. It’s the difference between flying, with a dashboard in the cockpit versus being able to see through like a crop duster and see through the windshield and know everything that’s going on. It’s just because of the scale of it. Most of the old tech companies are having a difficult time growing right now because there’s been such a shift to cloud, and to analytics, and to SaaS. And new companies, like Accela, the ones that are starting the kind of legacy free, are the ones where all the growth is coming from. And a being part of that growth story is very exciting. Samuel: Now that you’re in the growth game, with nimble companies that are very different than the HP that you left. What preconceived notions fell by the wayside once you’ve made it into Silver Spring? Jim: Honestly, there was a lot that I was able to bring from a process maturity standpoint from HP that Silver Spring needed to grow to. Companies go through different transitions. They go through a starter phase and then they go to a scaling phase and then they go to a more mature optimization phases. And then, unfortunately some of them start to go in decline after that. When I joined Silver Spring, it has just gone IPO six months before, so it kind of had a successful chapter one but it was really struggling with the growing pains of the company. And a lot of the entrepreneurial types that are drawn to startups really shun structure. They don’t want structure. And yet the lack of process and structure was really bootstrapping the company. So I think I came in at a good time when the company needed to put some more process and more discipline and some more rigor in terms of how the portfolio was planned and reviewed. How the businesses were run. Kind of getting the businesses do more of a sinus rhythm so that you could run more collaboratively cross functionally, etc. I consider myself a good chapter 2 guy, and I think Accela is in the same boat now. They’ve made a great name for themselves and now it’s just all about continuing to scale larger and do acquisitions and integrate them effectively and operate in multiple geographies and countries. It’s just a different way of working, but it’s what I like doing, it’s what attracted me to Silver Spring and what attracted me to Accela now. Samuel: Now that you’re CFO and you’re on your way to another success, what advice do you have for those that are aiming to move into that senior role over the next coming year? Jim: I think that getting as broad level of business and operational experience as you can. I spent nine years outside the finance function. In HP I was general manager of a couple of businesses. I ran multiple different operational supply chains and services and support and sales operations. You just get a totally different perspective looking through the lens of somebody in the business versus somebody in finance. I’m seeing more and more CFOs these days that didn’t necessarily cut their teeth and come up through the public accounting ranks. They’ve had a broader blend of operations. I think the CEO increasingly wants to be able to spend their time externally making a name for the company with customers and wants a CFO that can really make sure that everything, not just the numbers come together, but that the business is operationally being optimized continuously too. Samuel: What do you feel has made you successful? Jim: I think the combination of getting the mentors through my career that not only helped and coached me, but took chances on me to do jobs that I had never done before. Because I had kind of shown a track record before. I always believe your job isn’t just to run it, your job is to make it substantially better when you left the role versus when you started it. I took a lot of jobs where people told me to stay away, people who take those jobs get fired, kind of high complexity jobs, and those ended up being some of my more rewarding roles. Because when you go into something you really can make a name for yourself, it’s demonstratively better when you leave the role versus when you join the role. As long as the right elements are there for the role, there’s any number of roles. I sort of shy away from things where everything is working perfectly when you go into it because there really is no other way but down. This job at Accela has got all the things I want – relative to having a good fast growing market and good leadership position. But also a number of things internally that can use my experience and help to allow them to reach their goals a little quicker. The following is from an interview with Naresh Bansal. Naresh became CFO of Actiance in May 2016. 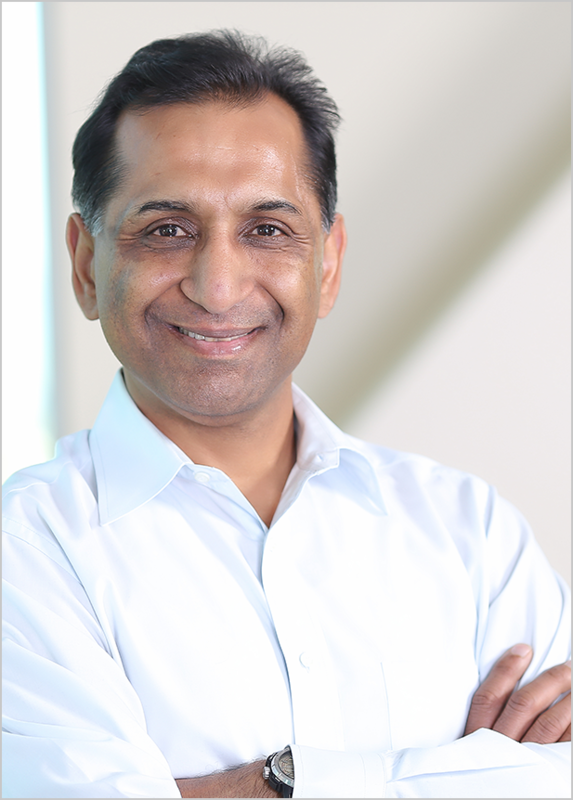 Previously, Naresh served as Vice President, Finance of ZScaler, as announced in CFO Moves. This interview was edited for clarity. Samuel: What attracted you to Actiance? Naresh: For the last 4 – 5 years, I was at a company called Zscaler that has done extremely well. I helped the company grow from a company of less than 200 people to a company of well over 800 people. But what really piqued my interest was there is such phenomenal opportunity for similar growth at Actiance. And after talking to the executive team and board members, and realizing how committed they were. It really helped solidify my interest in the company, and I decided that I do want to be part of this success story. The product which they had developed is so completely ahead of the technology curve, in the potential that it offers. It has a great executive team as well as great backers. The role of the CFO has evolved so much, we cannot do just finance; we have to make sure that we understand and are partnering with all the other parts of the organization – like marketing, sales, engineering, pretty much every part of the organization. You need to understand that they are part of the business, and to be a partner of that. You need to make sure there are defined processes around that growth. Especially when you’re growing at such a fast pace – it becomes even more important that we have all the processes in place. You need to make sure that you’re thinking ahead of the curve. Give them more responsibility. People want to be challenged. If you have people who are hungry to get more, they won’t be satisfied unless they are constantly being challenged. If people are given additional responsibility and accountability, they will rise to it. Be very open – if your counterpart has a better idea, be open to adopting their idea. Be collaborative. It’s not about people imposing their will on the next. You have to be constantly staying in touch with your network. It could be anyone. It could be the auditor that you work with, your external vendor that you work with. We all need to make a very conscience effort – this has to become second nature. Samuel: Each career move that you’ve made has been good for you. What does this opportunity have for you, in your ability to deliver and accomplish, that some of the other maybe didn’t? Naresh: I feel that the opportunity at Actiance is unique. When I look at the market opportunity, they have the top ten of the ten top banks as their customers. And it’s the ability of the company to monetize those customers. That was a very compelling reason. For me, having been the head of finance for my last company, this was a phenomenal opportunity to step into the more official CFO role of the company and help them grown substantially, to drive the strategy, drive the approach. This company is at the intersection of big data, social media and compliance. And all of these three markets are all growing at a phenomenal pace. This is reacting to great opportunities, in a much more regulated environment. Samuel: What are some of the new challenges that face you in this new adventure at Actiance? Naresh: There are 2 kinds of software companies. There are companies that have been born in the cloud. There are some companies that have been around for a while and are transitioning to the cloud. Actiance has both of those aspects. Actiance has been in a transition where they have been moving from a perpetual software licensing model to a cloud model. And this is really what I brought to the table – that past experience of having been in those fast growing SaaS companies. 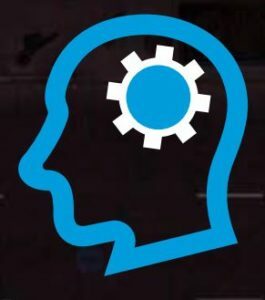 Bringing that mindset in terms of how you look at metrics, which metrics to look at, how operationally should we be looking at, whether we should be looking at the pricing strategy, looking at the compensation strategy for the sales teams, looking at it across the board, looking at how the planning needs to be done, etc. In SaaS companies, it’s a very different approach to all of these things. The second aspect is the rapid-growth the company was experiencing. How do you make sure there are defined processes around that growth? Especially when you’re growing at such a fast pace – it becomes even more important that we have all the right processes in place. And if we don’t have all those processes in place, then we’re putting them in place. We’re putting all the systems, the controls, the whole environment. When you’re a small company, you do what you do. But as you’re growing, you have to make sure that you’re thinking ahead of the curve, and that you have all of the right systems, the right processes. And looking at where the team has the experience and the tools to help build us to the next level. Samuel: Do you feel have enough of the right team members necessary to accomplish what you need? Naresh: It’s like anything else – as the company grows, there are different talents of people that we need to look at. As of today, when I entered the organization, there is the absolutely the right amount of people that we need. The people here are phenomenally dedicated. We do have the right team. But as the company grows, we need to make sure we have the correct leaders in all the areas. Samuel: What are some of the top CFO challenges that face growth companies – like yours – today? Naresh: Every company is different. Every industry is different. And every stage of growth is different. If you’re dealing with a very fast rate – how do you balance all of the requirements and all of the resources? Finance is one of the areas that you should be able to help with that. But what other things can you look at? How can I help the sales team deliver their growth objectives? How can I make sure as the CFO, I’m the enabler of that growth and not the impediment? It needs to be a good balance where you are growing at a very good rate, but at the same time making sure you keep your burn to a minimum. And where you are adding value to your investment along the way. To me, that’s the main challenge – how do you grow at a fast rate? And making sure that you’re very disciplined about your capital allocation. Samuel: As a leader. How do you develop other leaders? Naresh: There is the hiring of people who are very smart – even if they haven’t done everything, but that they smart and have a lot of potential. The other aspect to being a leader is to give your team a lot of guidance and mentoring and tutoring along the way, to be in a position that you’re able to guide other people, and to groom these folks to become the future leaders. And the third element is giving them more responsibility. People want to be challenged. If you have the right people who are hungry to get more, they won’t be satisfied unless they are constantly being challenged. To me, if people are given additional responsibility and accountability, people will grow. The problem then is – how can I grow? If I have a strong team, that going to help me grow? Will it help my role, help me to do more things, help me to partner with other parts of the business in a more effective manner. To me it’s all about hiring the right people. Helping and grooming them by providing them coaching, and by giving them more responsibility along the way. Samuel: Other than the CEO, who do you feel is the most important business partner for the head of finance in any organization? Naresh: Well, the CEO is the most important. But when I look across the table, everyone who is on the executive team is a critical component of that. Also marketing and sales are among the most important people. If you’re looking only at the numbers, everything smells great, everything looks great. So you need to ask yourself – how can I partner with the sales team to make them into a high performance organization, making sure they have the right quotas, making sure they have the right compensation structures in place. On the flip side, it’s sort of making sure we’re setting the targets in the right way. And by providing the correct incentives for the marketing leadership so they can effectively deliver. Supporting these guys with a large enough budget allocation so they can have the right tools in order to deliver these numbers. So it’s a very important partnership with sales and marketing. Similarly, for cloud operations and engineering, it’s about making sure we’re growing in all the appropriate areas – that we have enough engineering talent, that we’re bringing in more and more, and that we’re doing it cost effectively. Whether it’s putting all the data centers we have in different parts of the world, making sure we have the right contacts in place, so we can help the company scale as we grow. And since we are growing, we need to be looking at expanding in different geographies, and building multiple data centers. Samuel: What’s your style to get the other senior-level executives to work together with you? Naresh: We are very fortunate in that it is very collaborative – we all feel and believe we are going in the same direction. How do we make this company a big success? Everyone is looking for the ideas. And similarly, I’m very open to ideas – if my counterpart has a better idea, I’m very open to adopting their idea. Or if I have an idea, they are very open to adopting my ideas. It’s very collaborative. It’s not about people imposing their will on the next. Because, in the end of the day, it’s about how to create value for everybody. Samuel: What advice would you give to finance professionals who want to grow into the CFO chair? Naresh: The role of the CFO has evolved so much, we cannot do just finance; we have to make sure that we understand and are partnering with all the other parts of the organization – like marketing, sales, engineering, to pretty much every part of the organization. You need to be able to understand that they are part of the business, and to be a partner with the rest of the executive team. And not even just the executive team – but all the different parts of the organization, to understand their needs and their requirements. How to work with them in a better way, to collaborate and help grow the company. That’s one aspect. The external factor is networking. Networking is key. If you know your friends are the board members or the people that you work with, it’s not like you meet them once and they’re going to call you the next day for an opening. Because you only want them to call you when they have an awesome opportunity. Not just any opportunity that they have available. You have to be constantly staying in touch with your network, whether it’s the board member that you’ve worked with in the past, or some of the executives that admire your work and that you played a role in their success. It could be anyone. It could be the auditor that you work with, your external vendor that you work with. Everybody will want to work with somebody that has good success. And can bring success to your organization. Samuel: You’re preaching to the converted. All finance professionals will agree with that in principal, but they’ll always say – I’m too busy. How is someone like yourself able to give attention to that while being very busy? Naresh: This is one of those things where I wish I could do a lot more. It’s true, the job that you have at hand is far more important. But at the same time, networking is great. Some of the things that I have done personally is that I’m part of the local CFO group here which is call FEI, and they have the monthly dinner. And I at least try to go, if not every month then at least every other month. It’s a great avenue where they bring in a great speaker and have a dinner meeting, so at least you’re not taking anything away from your day. And then you have the fabulous chance to meet the rest of the leaders of the CFOs, share your ideas, and just be able to network. And even in my day to day job, things come up where I might have some questions, but at least I know I have a network of people who I can call and ask for guidance, and ask – have you ever had the same challenge? And how have you dealt with that challenge of such a scenario. Without sharing anything confidential. People generally want to help each other out. I’ve had people call me, asking for advice, and I actually feel like I’m privileged enough to be able to help out somebody. Samuel: Anything else you want to share with our readers? Naresh: I think we all need to make a very conscience effort to network – this has to become second nature. Especially as a CFO. Because, especially in my world, you’re not just managing your company, but your also constantly hiring as well. Networking is the key. And to try to learn and absorb. Every year – what have I added on to my skill sets. What more have I learned? And not just be content and think I’m the one who knows everything. CFO as Chief Growth Officer? What exactly is the role of the CFO anyway? In my book, Guide to CFO Success, my first chapter discusses what a Chief Financial Officer is. I say that the CFO needs to be a Strategist, Leader and Advisor, and those that act as such are able to become the business leader their company needs. My perspective is not the only perspective on this topic. 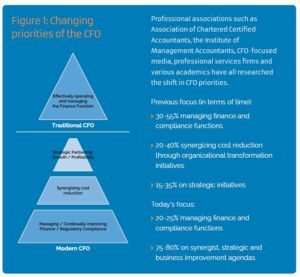 Those that follow the continuing discussion in print and online about the Chief Financial Officer see numerous perspectives in blogs, whitepapers and articles about what the CFO really is. …a “Chief Growth Officer”, a newer, more sharply focused evolution of the notion of the CFO as a “strategic partner” to the business. 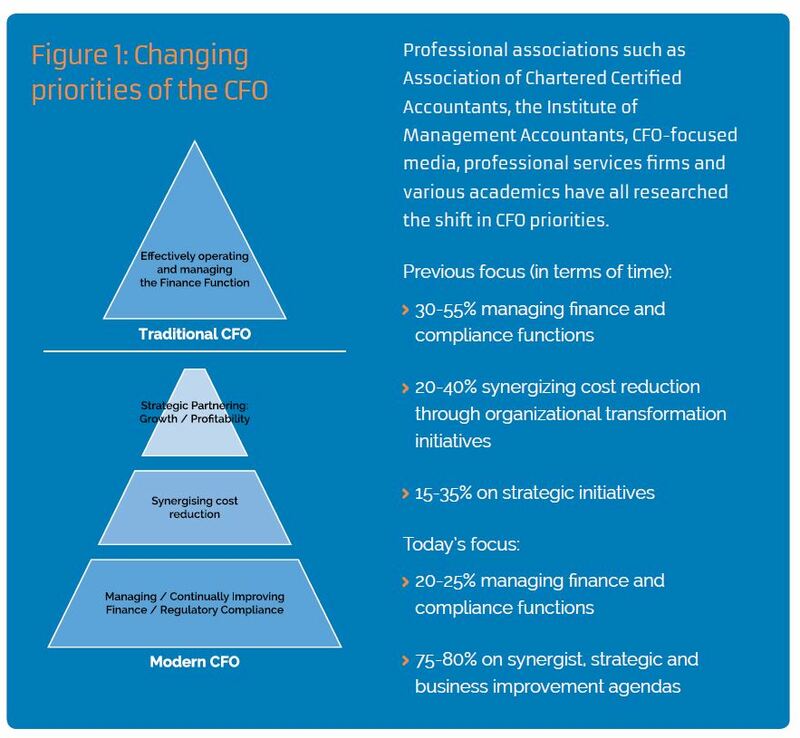 For those with an interest in the evolution of the Chief Financial Officer, this paper offers some worthy insights on how CFOs can move beyond the traditional and lead growth in their organization. To gain a better perspective on the CFO as “Chief Growth Officer”, I spoke with Vince Sparrow, CPA & CGMA, VP and Client Executive at EXL. Samuel: Why is Growth so important for the CFO? Vince: Growth is important for the CFO because it’s important to CEOs, boards and investors. CFOs who help drive the strategies that create growth not only increase shareholder value they also differentiate themselves as active partners to the CEO and the business. CFOs’ access to a broad cross section of data and the analytical skills with respect to finding and interpreting that data can make the difference in carving out new or more profitable businesses. Doing this quickly and efficiently requires utilization of new cloud and automation tools. Samuel: Why do some CFOs miss the opportunity to help grow their business? Vince: Some CFOs miss the broader opportunity because they are stuck in the older model as the organization’s scorekeeper and, a bit more advanced, as more passive advisor to the business. They may also spend so much time in gathering and validating information that they lose out on the opportunity to truly understand the implications in the patterns in the data – including external macroeconomic and political data. What are your thoughts about CFOs being organizational leaders for continued growth in their organization? If you have been following me for a while, reading my blogs and my book, Guide to CFO Success, you will know that I believe that relationships is the area where CFOs ‘make it or break it’. I continue to speak to CFOs about this because of the direct impact that successful relationships has on the Chief Financial Officer. When I ask CFOs if relationships are important, all of them agree. Yet when I ask them about to discuss the challenges they have in their corporate relationships, the conversation can go on for quite a while. Each of the 4 areas of corporate relationships for the CFO (who they report to, work with internally and externally, and who works for them) are important. The CFOs relationship with the CEO is super important. I do not know a CFO who thinks that it is not important to keep their CEO happy. Yet keeping the CEO happy means that you need to work on your other relationships as well. A recent Forbes article pointed me to a KPMG report mentioning that “CEOs are relying more and more on the CFO to be their partner”. CEOs put a huge value on people skills, but many see their CFOs as lacking in this area. Almost all (97 percent) of CEOs say that attracting and retaining top-notch finance talent is the most or equally important contributing factor in improving the finance function, yet only 33 percent give their CFOs a passing grade in talent management. Do you have a passing grade in talent management? If you do have a passing grade, shouldn’t you be a top performer when it comes to talent management? Is your Finance team holding you back? There are resources available on how to improve so that you can score higher on managing your talent (including, but certainly not limited to, my book and blogs). I have found that unless you (the CFO) make talent management a top priority, you will continue to limit your success. CFOs can only be as successful as their Finance team allows them to be. I’ve helped others and I can help you. Don’t let your Finance team hold you back. I speak with many CFOs in my role as executive recruiter, CFO Peer Group facilitator and executive coach. Each CFO, without fail, expresses that they are busy. The scale starts at ‘busy’ and goes all the way to ‘overwhelmed’. So I was not surprised to see the results of this recent report from EY. I appreciated this infographic, as it helps to explain why the Chief Financial Officer is feeling overwhelmed and under pressure. 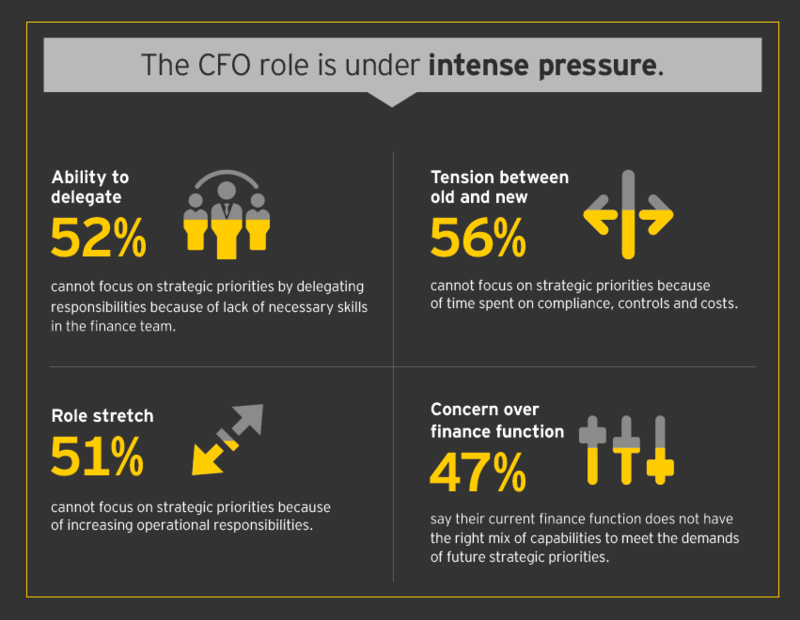 These four survey results identify two areas of pressure facing the CFO today. While there has been an evolution in what else the CFO is responsible for, the CFO is still the defacto compliance officer managing accounting, legal, HR, Facilities, and broad administrative responsibilities. I also asked my CFOs what can be done to resolve these pressures. Here are some responses. From a CFO disciplinary viewpoint, you need to define the stands where you say: “this is a MUST to have, and this is a NICE to have”. Ultimately, the role is CFO is defined by what expectations are. The CFO often lacks along with his organization an understanding of the business is one I see quite often from business partners. They just don’t visit customers, spend time with sales or other functions. As CFO, it is your responsibility to deliver what is expected of you. To do so, you need to get the buy in necessary. While platitudes reign, yet not enough CFOs have the ability to change the expectations. Too many times I hear “this is the way it is – I cannot change it”. As CFO, you have accepted this job in this environment. Either fix it, or find a more reasonable environment. It may not be the environment that’s the problem, but the person in the mirror who accepts the problem environment. No one wants to just do the best they can (certainly not you). You want to thrive and achieve more, better, further, faster. You can fix your team – you just need to have a plan and get buy in. As executive coach for CFOs, I have worked with Chief Financial Officers to help them accomplish this. While not an easy task, it will not get better by itself. You can move from the day to day to the strategic – you just need to make sure you have the people, process and technology that can take care of the day to day to give you time to be involved with the strategic issues. Prepare a vision of how you can focus on the strategic while your team properly covers off the day to day. Deal with exceptions as they happen, yet if exceptions happen regularly, they are no longer exceptions and you need to have the people, process, technology to deal with it. Sounds simple? It’s not. But unless you are going to tackle this head on, you will be unable to move beyond these challenges and continue to be stuck like most of your peers. What’s your plan to break the cycle? The following is from an interview with Vinay Mehra. Vinay became CFO of POLITICO in November 2015. Previously, Mehra served as Chief Financial Officer and Treasurer of the PBS/NPR media organization WGBH, as announced in CFO Moves. This interview was edited for clarity. Samuel: You’ve embarked on a new role. Why is this exciting for you? Vinay: The primary reason I came to Politico is because they have built a new business model. I love going into businesses that are creating and inventing new business models. Politico has redefined how to make money in the media business without just being dependent on the advertising side of it. That’s something that really attracted me– they not only created a new business model, but they are also hugely successful in this new business model, and I want to be part of that. What makes a good CFO? CFOs often forget that we are story tellers. And we need to tell a story with the numbers. We need to overlay the non-financial data with the financial data to complete the picture. Underappreciated skillsetThe most underappreciated skillset in finance is the cost-accounting mindset. Once you have a good understanding of true cost, and once you figure out how much of that is the standard cost, it becomes easier to manage and scale a business. I find it very fulfilling. One tends to forget, in life, we all have the responsibility to give back to society. Whether it be money, or donating your time and skillset to a needy organization. This work force wants constant change and they’re not willing to stay with the status quo. Therefore they are constantly adopting new technologies, or adapting to new way of doing things. The biggest assets here are the people. I really feel that HR is probably the most strategic department of this company. And that is where we have to make the investments. The CFO is, in a way, the chief sales person. He is the one who sets the tone of what the organization is doing. He needs to keep providing a positive spin on how the business is doing. To be able to tell people the story even in the worst situation. He not only has to be a fabulous story teller, but also has to be a great sales person. Samuel: You’ve had a good long run from your previous experience, in more of a television environment. And now you’re taking that to a new and exciting “new media” environment. What perspectives are you bringing to this new business from your years at WGBH? Vinay: The first thing I can think of is that the most underappreciated skillset in finance is the cost-accounting mindset. The media business is heavily capital intensive. Having to understand the cost is really important. And thanks to my experience in accounting for 10 years, I had alot of clients – manufacturing clients, tech clients – one of the things they taught me was the concept of cost-accounting. Once you have a very good understanding of true cost, and once you can figure out how much of that cost is a standard cost, it make it much easier to manage and scale a business – rather than just focusing top line goals which is just the revenue side of it. And I think what TV broadcasting taught me is – that it is a business which is hugely capital intensive. For example, if we had 5 to 10 million dollars to make a TV show, we would have a very robust cost-accounting system. We would knew down to the penny, and down to an invoice, what everything was being spent on. And for which episode. So taking some of that same discipline is what I inherited from my experiences in the broadcast side of things and brought it into the “new media” side of things. And that was pretty hard to do – because you’ll have journalists writing their stories, and then they’re putting up their stories up on websites, or newspapers. And then you have to figure out how that translates to revenue – which are the stories that are actually driving traffic to the website, which are the stories that are driving revenue. And then figuring out the cost allocation system. So I think that going from old media to new media is where I found the benefit of having the ability to build a true-cost evaluating system. On the revenue side, there is alot more diversity in the revenue field; more in new media than there is in the ‘traditional’ media space. Because the new media companies treat content as information, they don’t treat it as just content. The content that’s on the website should be driven by analytics. And they should decide what really makes sense to put on the website. But more importantly, let’s not just treat it as entertainment, let’s treat it as information. So there’s the mindset of it being an information company instead of being just a media company. Samuel: What do you think makes you a good CFO? Vinay: I think there are 2 kinds of CFO – there are CFOs who are very financial focused, and then there are CFOs like myself – CFOs who blend the financial and the non-financial data. What I have found in my career, what has made me successful is the fact that I am able to overlay the non-financial data with the financial data itself. So I can tell a story around what exactly is happening. And in every financial function I’ve had a small group of people doing data analytics. But they’re putting non-financial data and they’re trying to see if it tells a story. I think very often we CFOs forget that we are story tellers. And we need to tell a story with these numbers. Just by looking at the numbers it’s hard to tell a story, unless you have the non-financial information to overlay to show if there is some kind of a trend; or to show what is driving those financial numbers. So I would say that I am very much one of those people who loves to tell the stories behind the financial and the non-financial data. Samuel: I also see that in your career you’ve been very involved in not-for-profits. How has that helped you? Vinay: I think it’s very fulfilling. To be honest with you – one tends to forget, in life, we all have the responsibility to give back to society. And I personally found it very fulfilling to be involved in different causes – to give back to my city, my town, to my local cultural institution. And that’s one thing I would encourage everyone to try to do. It’s less about being on another board, its more about feeling how I’m able to give back. And giving back doesn’t necessarily need to be about giving money – it could be about giving your skillset, and your guidance to these organizations who don’t have allot of sophisticated management skills. They have a mission, and as long as you are in mind with the mission, you can help in many different ways. Helping to make it successful and running it like a business. Even a not-for-profit has to be run like a business and sometimes they lack the skillset. For me it was something very fulfilling, and something I’m glad I got involved with. Samuel: And how did that benefit you? What impact did it have on you as a professional and as a CFO? Vinay: Sometimes, as a CFO, you tend to look at things are pretty black and white. Things are just numbers. But when you get involved with a non-profit, the thing that I’ve come to appreciate is – sometimes, when you are making an investment, you don’t have a true ROI, from a financial perspective. But you will have ROI from a human impact. Or from the bigger benefit of the people, or of this country. For example – when I was in WGBH, very often we needed build TV shows and I would say “hey – no one is ever going to buy this show, no one is ever going to agree to do a big sponsorship for it”. And while that’s true, someone needs to tell the story of lack of diversity, or to tell the story of some other area which nobody else is willing to put the money in to do, because they don’t see the financial ROI on it. But we have a responsibility to tell that story. So we’ll spend money on it because that’s really our core mission is – to educate people. So I would say it’s given me the appreciation to understand that sometimes in business you will make an investment in something that may not have a true ROI, but there will be other ways to measure ROI beyond the financial terms of things. Samuel: What was most surprising for you when you showed up at Politico? Vinay: The energy and the passion around their mission of providing political information to their audiences. They are all uniformly passionate about this subject. You know, it’s not often you walk into a business where everybody – from the administrative assistants, to the help in the kitchen – are all uniformly passionate about this stuff. It’s amazing. And it make everything alot easier, because everyone is aligned with the mission. Everybody is very passionate about what difference they want to make. And the second thing – which came as a bit of a surprise for me – was the millennium demographic, which is a large proportion of our employee base – between 25 to 28. They’re working at a much faster pace than you or I do! And I love working fast and changing things, but this work force wants constant change and they’re not willing to stay with the status quo. Therefore they are constantly adopting new technologies, or adapting to new way of things. And they crave it, and they keep pushing for it. This has been a big surprise for me, coming from big corporations where change is so hard, and it’s so hard to get people on board, or to follow new ways of doing things. Samuel: It must be a big change, coming from NPR-type of background, where you were truly middle-aged, taking a look at everyone around you. Coming from an environment where you were one of the younger ones, to an environment where you’re one of the older ones. Vinay: Yes – and the other thing is I think their desire and energy for staying in the forefront of technology and processes – it’s in their DNA. You don’t have to tell these people – they live this every day – how can we do things better. They’re built this way. And I think some of it is maybe because you don’t have the luggage of a traditional media company and all the headaches of running a traditional media company. But this is a company that continues to innovate every day. In every way – from how to come up with new revenue ways, to how can we become more efficient to how to use new technology. It’s just blowing me away. And it’s very refreshing to be an environment like this. Samuel: And how does that translate for your finance team? Samuel: So what are you doing to put change into a finance group that needs to be changed a little bit? Vinay: The first thing I’ve done is to physically relocate people from my finance team into business groups. The people who do invoicing and billings and collection for my ad business used to sit in finance, in a central location, and I’ve taken them out of there and said go sit in the unit. Go sit in the business. Go see what they do every day and be part of their workflow, instead of sitting separated on a different floor and communicating through emails. I think that’s given them a sense of appreciation how the business operated, that they never knew before. Secondly, substituting some of the skill sets that are lacking on the team, I bring in new people. For instance, somebody with more experience and or somebody who is an expert in certain areas is going to have expertise in their DNA of the finance function and will be able to figure it out as they go along. Which works to a certain point, but then a lack of knowledge and a lack of expertise because of the hindrance. And the third thing is technology. They are very advanced with leveraging and using technology here. And because of that, the business units have gone off and made selections of technology products to streamline their operations and their processes. And on the back end of things you have finance working on QuickBooks because they haven’t kept pace with the evolution and change that has happened in the business. Samuel: What are you ultimately responsible for, at Politico? Vinay: I have Finance, I have HR, and I have Operations. I have pretty much ALL the business operations of the business. Basically all the non-editorial side of things. Samuel: Have you always had HR responsibility? Samuel: How does it feel to be responsible for human resources in an environment that’s growing, dynamic and where culture is a key part of the talent pool? Vinay: To be honest – the biggest assets here are the people. They don’t really have any physical assets here. And so preserving that asset base is extremely critical, for the organization. And we are thinking about additional approaches – until now we took for granted that we’ll have 20-30% turnover and keep hiring new people. My philosophy is we need to find a better way of keeping this from happening instead of constantly dealing with this turnover. And I get excited about the fact that I can help influence and be a caretaker of the culture of the organization. I feel that it’s a great opportunity for the organization to be able get what they are looking for, from a cultural perspective. Sometimes I feel that an HR reports directly to the CEO of an organization, and they tend to take a more of an administrative function. I really feel that HR is very strategic and probably is the most strategic department of this company. And we have to make the investments here. This is where we need to put the most focus – to help make sure that we can keep our employees. Samuel: What advice would you give to someone in finance that’s trying to work their way up and wants to become successful in their career? Advice that you wish someone would have told you? Vinay: I would say that having an understanding of the numbers and the context of the business, the strategy of the business is extremely critical in this day and age to be a successful CFO. Early in my career, when I was in accounting, I think the reason why I was so successful with my clients is because I was able to focus on their business problems, not just their financial problems. Additionally, in some ways the CFO is also kind of the chief sales person. He is the one who sets the tone of what the organization is doing. He needs to keep providing a positive spin on how the business is doing. To be able to tell people the story even in the worst situation. And so what tends to sometimes happen is that we forget that we have the DNA of a sales-person. We need to use that. Whether we are talking to our salary employees, or if we’re talking in external shareholders or investors. And I feel that anyone who wants to grow their career in a finance perspective, not only has to be a fabulous story teller, but also has to be a sales person.